Hair Restoration in Savannah Georgia. Patients are charged per graft, each graft containing an average of 1 to 6 hair follicles. The Cost per graft is $4.50, and the average hair transplant cost depends on how many grafts are needed. 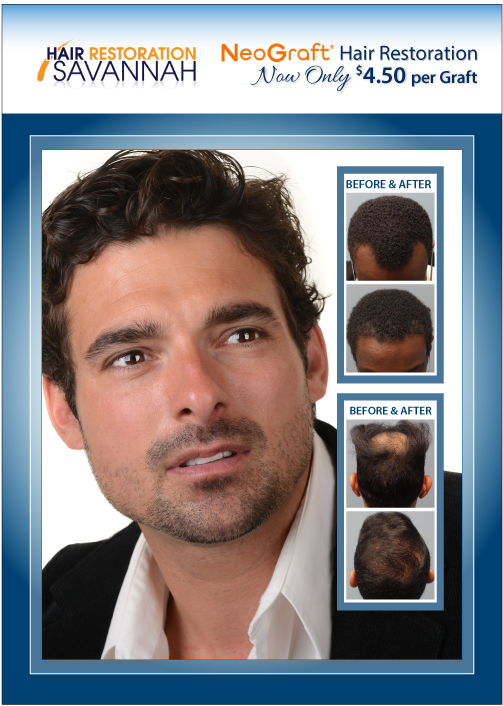 The lowest graft amount offered for hair restoration is 500-700 grafts. Featured below is one of our patients that received 1500 grafts and achieved great results within just 5 months. Our NeoGraft Technicians are highly skilled and our Medical Director Dr. E. Ronald Finger is a board certified Plastic Surgeon with 40 years of experience as a physician and surgeon. Neograft may exceed the cost of traditional methods, but the hair survival rate is 98%, and the biggest benefits are that there is No Scalpel, No Stitches, and No Linear Scar, needed. Recovery is minimal and the patients can return to their normal activities within a few days after the procedure. No general anesthesia is needed for either method of hair restoration. Dr. Finger also offers the Strip method to his patients and will recommend the best options for Hair Restoration to you. The Strip method is more affordable and Dr. Finger can retrieve a higher graft amount in one setting than with Neograft. Read more about Neograft versus “Strip Hair Transplantation”. Some patients may only require 500-700 hundred grafts, whereas others need 2000 or more grafts. Interest-free financing is offered to all patients for up to 12 months. Monthly Specials are often posted on our website at Fingerandassociates.com. Specials often include Platelet Rich Plasma Scalp Therapy with Dallas Sellars our Injectable Nurse. Find out more about PRP Scalp Therapy today. Contact us for a complimentary consultation and your Hair Analysis.